La Sassellese is pleased to invite you at ISM 2019 Fair in Cologne, Germany, from January 27th to 30th 2019. ISM is the world’s leading trade fair for sweets and snacks. The world’s leading trade fair for sweets and snacks bids is starting again. A successful combination between impulses and innovations, exciting networking, first-class exhibitors and competent visitors forms an offer that is unique around the globe. Here, you also find the world’s largest offer of private label in sweets & snacks. Heart and soul: in conjunction with ProSweets Cologne, the international supplier trade fair for the sweets and snacks industry, ISM represents the entire industrial value chain. From January 27th to 30th 2019, the trade fair duo will once again turn the cathedral city into the hotspot of the industry. From chocolate and confectionery, to biscuits, through to snack items: with its multifaceted range of offers ISM reflects the entire spectrum of products on the sweets and snacks market. Not least thanks to its high degree of internationality in terms of both its exhibitors and visitors, the event confirms its leading role in the industry year for year. Around 37,500 trade visitors and 1,656 exhibitors acquired a taste at this year’s event. ISM also holds new trends, perspectives and business contacts in store again in 2019. La Sassellese is proud to be part once again of this leading international fair: the event is an opportunity to witness new trends and deepen our knowledge in the direction of continuous research and development for products processing. Also, we will be able to confront with our competitors, to review best practices, putting them at our consumers service. We are going to meet customers from different countries, aiming to spread our production more and more. As always, we will show everyone the ligurian pastry tradition: on top our soft Amaretti, prepared according to the recipe that respects rules and laws in the field of excellence and product quality, the chocolate covered Amaretti and our classics Canestrellini and Baci di Sassello. You can taste our products in these “four days of sweetness”. 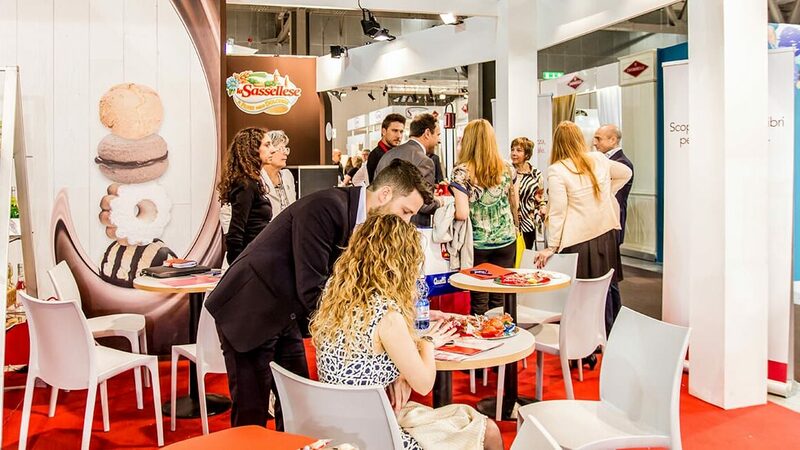 La Sassellese è lieta di invitarvi alla fiera ISM 2019 a Colonia, in Germania, dal 27 al 30 gennaio 2019. ISM è la fiera leader mondiale per dolci e snack. La fiera leader nel campo di dolci e snack industriali torna nel 2019. Una combinazione vincente tra innovazione, networking, espositori di prim’ordine e visitatori competenti costituiscono un’offerta unica in tutto il mondo. Cuore e anima: in concomitanza con ProSweets Cologne, la fiera internazionale dei fornitori per l’industria dei dolci e degli snack, ISM rappresenta l’intera value chain industriale. Dal 27 al 30 gennaio la coppia fieristica trasformerà ancora una volta la città della cattedrale nel cuore dell’industria dolciaria. Dalla cioccolata e dolciumi ai biscotti, passando per gli snack: con le sue molteplici sfaccettature di offerta ISM riflette l’intero spettro dei prodotti sul mercato. Non ultimo, grazie alla sua rilevanza in campo internazionale, sia in termini di espositori che di visitatori, l’evento conferma il suo ruolo di leader nel settore. Circa 37.500 visitatori specializzati e 1.656 espositori hanno partecipato all’evento del 2018. ISM vuole confermare le nuove tendenze, prospettive e contatti commerciali anche nel 2019. Come sempre faremo scoprire a tutti la tradizione dolciaria ligure: in esposizione i nostri Amaretti morbidi, preparati secondo la ricetta che rispetta le regole e le disciplinari in campo di eccellenza e qualità del prodotto, gli Amaretti ricoperti al cioccolato fino ai nostri classici Canestrellini e Baci di Sassello. Potrete assaggiare i nostri prodotti in questa quattro giorni di dolcezza.